Recently, Mike published an article introducing a local company named Goal0 (article link). They develop solar products to fit a wider variety of needs than your average solar pack, and so we were very intrigued as to their application to a prepper mindset. This set differentiates itself from the Escape and Extreme kits by targeting a much more mobile user. The power pack is a Li-Ion battery kit like a laptop, so compared to other devices it is extremely lightweight. The pack’s themselves are very ruggedly built, obviously for mobility. The cases are also designed in such a way that they can be stacked together, and fit much like a lego tower, which you can then strap together to fully secure. Now why would you want to stack these? Because they are designed to daisy chain together to provide more power if you need it. With normal solar kits and batteries, chaining batteries for usage can always be a pain, trying to remember how to wire it for parallel, or serial usage which will determine how much voltage your batteries are putting out. Do it wrong and you can fry your equipment. With the Goal0 packs, this isn’t’ a problem, you just have one wire that comes out the back, and plugs into the next device. This was a nice feature for me, as I could only afford one power pack for now, but I know I’d like to expand things later on. that I could use to give a charge to a car battery, then power other devices from there. For this product I wanted something a little bit different. I was really looking for something that I could easily move around with me. If I wanted to, I needed to be able to add this to a backpack to power my laptop and camera, or other mobile devices. Obviously that’s not something I want to be doing with a car battery. The alternative option available is the Escape 150 product, which is “portable” in that it has a handle, and provides a bit more power. However the escape series uses a lead-acid battery, and is quite heavy. Not the ideal for my usage. In the promotional videos for the Sherpa series (embedded below) you can see the design of the Sherpa products lends itself well to a bug-out, or mobile situation. Note they are carrying these batteries in a situation where space and weight are major concerns, using them to recharge multiple types of electronics in the night. If I’m simply camping to camp, I’m not going to bring this along, it still does have a bit of weight, and bulk that I don’t’ need. But If I was in a situation that I needed to power multiple devices, say during a CERT exercise, or with a search and rescue group, then this is an ideal setup. In a non-emergency type of situation, they are excellent for photography (as shown), as well as powering of recharging laptops and for powering their available Light-a-Life LED lights. After trying those out I’m sold, they are amazing; bright and very efficient. I really like that the power pack allows you to easily charge from your AC wall connection, quite rapidly at that, before heading out. It allows you to have a no-fuss charge when going somewhere, and not wanting to deal with the solar kit. Once out though, the 27-watt Nomad panel is great. It folds down into a bundle only slightly larger than the size of the battery pack itself. Unfolded you can actually wear it over your backpack to charge while hiking. With a peak of 27-watts you could theoretically charge one Sherpa-120 in a few hours, but Goal0 is honest in their advertising, and tell you to expect 8 hours due to always changing conditions. They’ve paired the panels with packs in a manner as to always completely charge the battery in an average day, under sub-ideal conditions. That’s great forethought when comparing to other solar kits which tend to advertise based on ideal situations, which never really happen. What good is a battery if you can’t use it? The Sherpa series makes this extremely easy to do. First of all, most small devices nowadays have the ability, and often the preference of charging via USB cable. The packs include a USB because of this, and so I can take my iPhone and plug it straight into the pack and turn it on, no problems. Goal0 devices such as the Light-a-Life can plug straight into the battery and run via DC power causing much less loss to AC conversion. To make this simple, the Goal0 products all use a round plug interface, so you dont’ have to worry about any wiring. If you have a vehicle DC adaptor (Cigarette lighter type), the battery’s include a cable taking their standard interface to a 12v receiver, so any devices can run this way. You can run any inverter in this manner, if you already have one. However the Sherpa kit comes with their Sherpa UI device. It is a standard inverter handling up to 100w in usage. 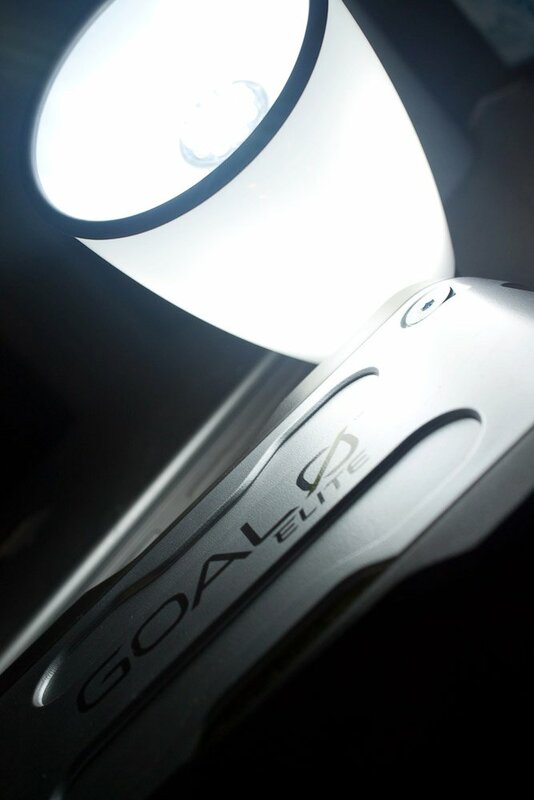 But what makes this device shine is how it is designed to work with the rest of the Elite tools. You can attach it to your batteries using their built-in chaining cable, just attach it like another battery at the end of the chain (if you have more than one). The UI is also designed with a universal plug interface, so it can accept all forms of international cables, in case you travel a lot or have international devices. It also connects and can be strapped together with the batteries for a secure bundle. The Elite/Sherpa series from Goal0 was by far the best product in its class that I could find. No other company had a product that provided as much power, in a rugged form, that was so mobile. Everything else was way underpowered, or just a car-battery kit, that required lots of extra work. 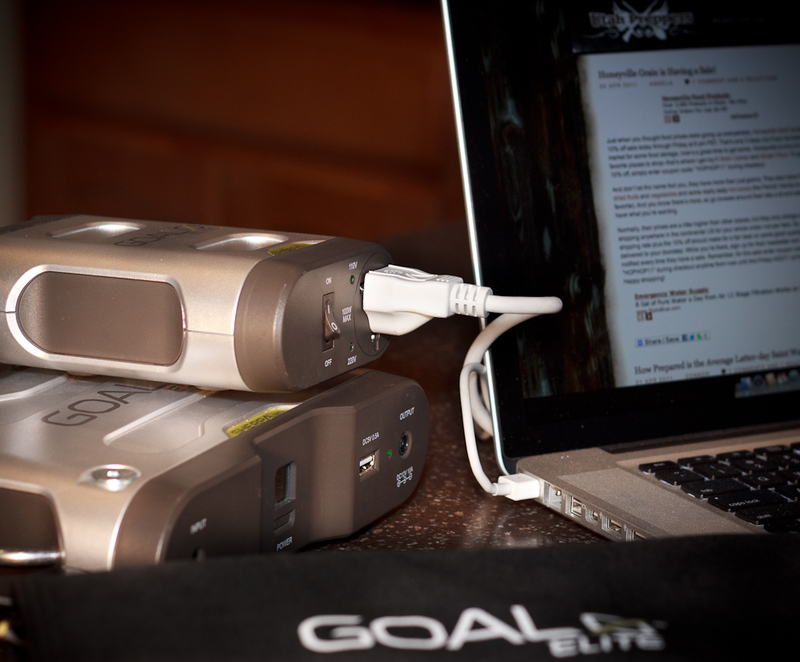 Goal0 has taken care of all the hard work to create a very elegant solution for the backpacker. This is not, however, the single solution for everybody. If you want an emergency power source that you can just always leave plugged in, ready to go or if you want something that only has to be portable enough to toss in the car for some car camping then you’ll probably be better served by the less expensive Escape series. If you are trying to run quite a few laptops, or maybe mobile flash equipment for photography, then these won’t have enough juice for your higher end needs. Look at the Extreme line possibly. But if you want enough power for several smaller devices, or a medium device such as a more power hungry laptop this is your gear. to buy the Goal0 gear, we love to support local stores. 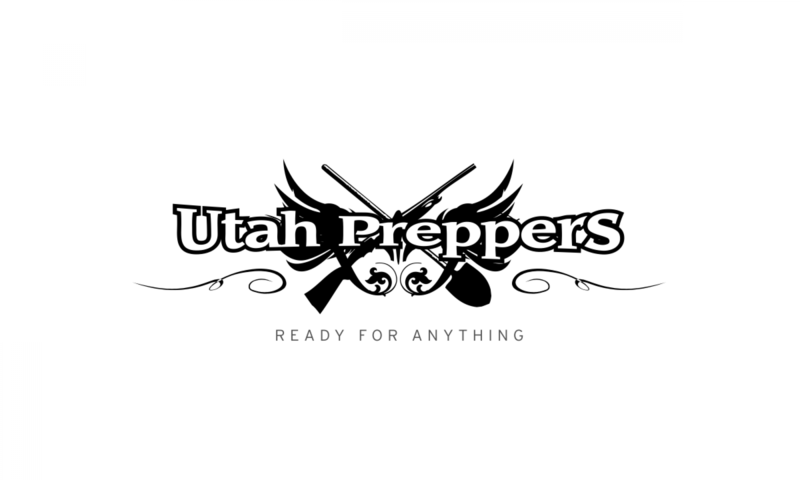 GetPreparedStuff, Emergency Essentials, and The Ready Store all keep some products in stock. As an added bonus, the owner of Get Prepared Stuff approached us and said he was more than willing to work out local pick up discounts, cash discounts, and especially group buys for notable discounts (varies per product). If you are interested in getting a better deal, contact him directly by email groupbuy ‘@’ getpreparedstuff.com.